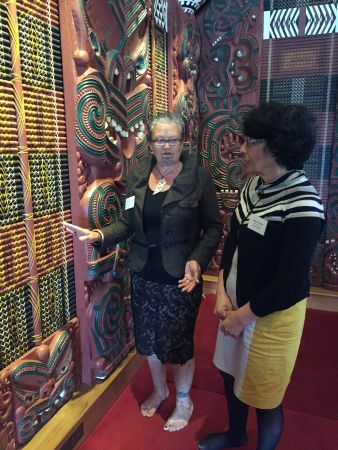 Iwi from around the country gathered in Whakatane during November, to share behind-the-scenes insights from iwi heritage projects, from “bricks and mortar” cultural centres, to digital repositories and travelling exhibitions. 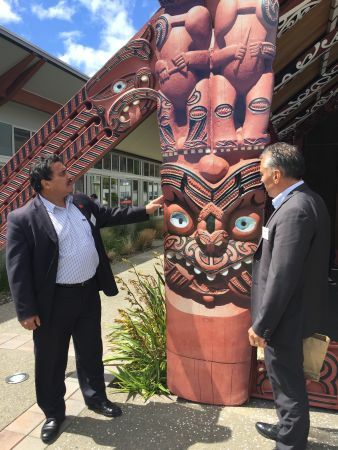 Tūhonohono i ngā Taonga a Iwi: Preserving Iwi Cultural Heritage looked at the growth in iwi cultural centres, and other innovative ways of preserving and sharing iwi heritage. The hui was jointly hosted by Te Papa’s National Services Te Paerangi and Ngāti Awa, at Ngāti Awa’s stunning Mataatua wharenui in Whakatane. Weaver Tumuwhare Tarei-Rangitukehu and Te Papa textile conservator Rangi Te Kanawa discuss preservation of textile taonga, in the Mataatua wharenui in Whakatane. Image: Te Papa. Linnae also observed the power of cultural projects to bring a community together. “Ask yourself, what is the thing that’s going to bring you together? In a lot of instances it was a taonga being returned, but it could be the revitalisation of reo, or a waka voyaging. It might be the smallest taonga in the world but it could be the one thing that brings your people together”. Ngati Awa’s portable Treaty of Waitangi exhibition enables them to share their story with communities far and wide. Image: Te Papa. Mataatua wharenui, where the hui was held, has a number of innovative ways of preserving and sharing the heritage of Ngāti Awa. The light show, HIKO, in the wharenui, lets the carvings themselves tell their own story. 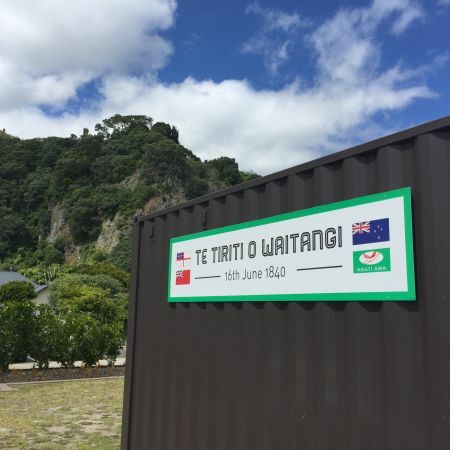 The Rūnanga have invested in a purpose built portable exhibition space in a shipping container, enabling iwi exhibitions to get to the heart of the community. It is currently showing the exhibition Ngāti Awa Treaty of Waitangi. Probably the most controversial element of the wharenui is the new photo replicas in place where the amo (carvings) once stood. Due to their age the carvings have been retired and new replicas will be commissioned in the near future. Te Papa Kaihautū Arapata Hakiwai and historian Monty Souter discuss the epa of Mataatua wharenui. Image: Te Papa. Tuhoe’s Te Wharepuri is a building that lives in harmony with the land, using zero water and energy. As well as housing the iwi authority, the earth-brick building contains an archive, library, meeting space, and innovative artworks by young Tuhoe artists. Tuhoe’s Maringi Baker said: “as heritage people, we live in the future. We were building a building for the future.” Te Wharepuri opened in March 2014. Hera Ngata-Gibson explained that Te Aitanga a Hauiti has created a digital repository, rather than a physical cultural centre. “Bricks and mortar wasn’t for us, it wasn’t the industry we wanted to develop. We want our people to be creators, not end users, of technology.” The iwi partnered with Cambridge University in England to create a database of taonga held in museums internationally. “At the end of the day it’s about kai on the table, and developing good citizens”. The hui was generously supported by the Ministry of Culture and Heritage, Te Puni Kōkiri, Heritage NZ, Ngā Taonga Sound and Vision, Alexander Turnbull Library, NZ Micrographics, Tohu Wines, Aotearoa Fisheries, Department of Conservation, and Digital Navigators Ltd.